We’d love your help. Let us know what’s wrong with this preview of Her Best Friend's Secret by Anna Mansell. It’s been over twenty years since four very diff Your best friend deserves the truth. But it will ruin her life. What would you do? To ask other readers questions about Her Best Friend's Secret, please sign up. What if you have a secret? What if you know a secret? What if that secret could hurt someone? What if that secret could change lives? What if that secret could alter relationships? Would you tell the truth? What would YOU do? It has been twenty years since Emily, Jess, Lolly and Amanda sat on a beach and promised to be best friends forever. Time, circumstance, moving, careers, happened as they often do when people grow up and the four friends drifted apart. But after a chance meeting between Loll What if you have a secret? What if you know a secret? What if that secret could hurt someone? What if that secret could change lives? What if that secret could alter relationships? Would you tell the truth? What would YOU do? It has been twenty years since Emily, Jess, Lolly and Amanda sat on a beach and promised to be best friends forever. Time, circumstance, moving, careers, happened as they often do when people grow up and the four friends drifted apart. But after a chance meeting between Lolly and Emily, Lolly decides it's time to get their group together once again. All the women have changed. Their lives have taken them in different directions and some of them have secrets. At their reunion, they all realize that their bond is still there and even though some have deep buried secrets that worry them, it is not until it is disclosed who one of them is married to that their tight knit bonds could be tested. Friendship, marriage, heartache, heartbreak, lies, deception, betrayal, support, understanding, acceptance, and moving on are all here in this book. Ah, the friendships forged in youth - is there any sweeter kind? Someone who has known you and experienced all the growing pains with you. They loved and accepted you through the gawky phase, the acne phase, the bad clothes, the bad hairstyle (spiral perm, anyone? ), dating woes, etc. They studied with you, they broke rules with you, they shared secrets with you, they got in trouble with you and they loved you through it all. Still have your friends you grew up with? I do, making this book relate able. Ever wonder why we can meet someone in the present day and don't get those butterflies in your stomach like you do before that high school reunion? Caring what people, you have not seen in twenty years will think of you, how you look, if you gained weight, if you achieved your dreams, etc. These women had similar thoughts. Not having seen each other in so long, wondering if they will be judged for a career choice, for carrying a torch for someone, for coming home, etc. This book is about friendship, betrayal, marriage, friendship and second chances. I found this book to be a fast read. I enjoyed most of the characters and although, I figured out one thing very early in the book, it did not affect my enjoyment of the book at all. This book was pure escapism reading for me. Getting together with friends one hasn't seen in a long time should be a happy time but growing up comes with adult issues. It's how we navigate those issues that matters. Entertaining and thought provoking, this book had a few twists and turns along the way. Real, raw, and relatable, this book was packed with friendship, secrets, and truth! What if a secret would destroy your best friend? Would you tell her? Is there anything sweeter or stronger than those friendships you formed in your youth? The girls you swore you would be BFFs with forever? The girls you confided in and cried too, The girls who stood by you and supported you through all your firsts. This book was steeped in sentiment it had me feeling nostalgic for my teenage years. I think what Real, raw, and relatable, this book was packed with friendship, secrets, and truth! What if a secret would destroy your best friend? Would you tell her? Is there anything sweeter or stronger than those friendships you formed in your youth? The girls you swore you would be BFFs with forever? The girls you confided in and cried too, The girls who stood by you and supported you through all your firsts. This book was steeped in sentiment it had me feeling nostalgic for my teenage years. I think what drew me so completely into this book was the fact that I have thought many times of what it would be like to reunite with all my closest High school friends. Just as in this book we have all gone our separate ways, but whenever we have an opportunity to see one another we just pick up where we left off. I think most readers will find this book very relatable, they will see a little of themselves and their friends in each of these characters. Emily returns home to small town Cornwall after being away for 20 years. Soon there after she has a chance encounter with a high school friend Lolly. This eventually leads to a reunion of Emily, Lolly, Jess, and Amanda. The four girls were close as can be in their teens, but like most friendships of youth they went their separate ways. Now they are all living in the same town again and being together seems like old times, however they all have some secrets to hide. Some secrets are bigger than others... some secrets will hurt others, some secrets will hurt yourself, and some secrets will destroy life as you know it. All they know is that they are so happy to have one another back in their lives, and they don’t want to do anything that will jeopardize that. what do you do when the truth could harm something and someone you hold so dear? This was an engaging read that I thoroughly enjoyed. These women were so authentic, and I truly felt for and related to each of them. Life is messy and it is complicated, but it is a little easier when you have a friend around to help you pick up the pieces. Ultimately this is a story of friendship and the bond between women, and what an important part that plays in our lives. It is about forgiveness and acceptance, not only others but yourself as well. Anna Mansell has written a compelling story that asks some tough questions. Full of heart and friendship, I absolutely recommend this book! This one is the story of four women who when young were the best of friends but as time went by they had lost touch with one another. Twenty years have passed since these four were teenagers together and now Emily who had move Her Best Friend’s Secret by Anna Mansell is another book that falls into my own personal genre of popcorn reads. In other words grab a nice big bowel of popcorn or you’re favorite snack and sit back and enjoy the drama only to make you feel your own problems are not so bad. Best friends forever? They made the promise during their teen years and so much has happened since then, is it still possible? This is an emotional story that drew me in right from the start. I was absolutely intrigued with the lives of these four women. Why did it hold my interest so intently? It is because their stories are so darn easy to relate to! These women could be my friends that I grew up with! I feel like everyone has that group of friends that they grow up with and they truly believe Best friends forever? They made the promise during their teen years and so much has happened since then, is it still possible? This is an emotional story that drew me in right from the start. I was absolutely intrigued with the lives of these four women. Why did it hold my interest so intently? It is because their stories are so darn easy to relate to! These women could be my friends that I grew up with! I feel like everyone has that group of friends that they grow up with and they truly believe that they will always be there for each other. Yet as the years go on they drift apart. Much as these girls did, it had been 20 years since they had seen each other. After a chance run in where Lolly bumps into Emily, they plan a get together with all the girls. This will go one of two ways...either really awkward or they will pick up right where they left off! This story is so well developed, that I felt like I know each woman personally. I loved each one and all their little insecurities, because let's face it, everyone has them. They had secrets they had kept from each other and little lies they had told. It begged to ask the question is it worth it for the truth to come out if it will destroy another person's life? Especially someone you care deeply about? Are some things best left unsaid? It is so easy to put yourself in their place because each one worried that the other would judge them on their life's choices. As they got more comfortable with each, little by little things surface. Things that can destroy lives. Friendships forged in childhood especially in the teenage years are never forgotten. Even if the meeting takes place 20 years hence, the heart always recognizes the love and draws in together. The same was seen with Emily, Lolly, Amanda, and Jess who met after 20 years with secrets galore between them, yet one look at each other just erased the distance between them. It then felt like they had never separated. They stood up for each other. Anna Mansell was brilliant in her writing, she knew how to Friendships forged in childhood especially in the teenage years are never forgotten. Even if the meeting takes place 20 years hence, the heart always recognizes the love and draws in together. Anna Mansell was brilliant in her writing, she knew how to draw me in, filling me with a curiosity to know more about these ladies. They were in their forties and had seen their share of life, but I loved the way they bonded together. The best part for me was that they accepted each other as they were, knowing each other's quirks. This is generally seen in women who have grown up together. This book started a little slow for me, but by the halfway point I was captivated with this story and the fierce bond the women had with one another. I was equally captured by the conflict between them. I had so many questions, questions that were slowly answered throughout the novel and in just the right time. This book shows how even though we can have the fiercest of bonds with someone, guilt can bring us to doubt, to point fingers, to desperately want logical explanations to the extent to which we would throw someone under the bus to get them, no matter how much we love that person. The plot is full of rich characters. They are all over the place with their decisions and behaviour. These women have so many flaws and issues and secrets. Layer after layer is uncovered, and you never expect what lies underneath or why they do what they do. I also loved the ending, as each woman becomes a stronger version of herself and three of the four manage it without a man. I don’t know how Anna Mansell does it – the characters have so much going on, so much happening behind the scenes, and the plot is intricate, with surprise twists and the focus and mistrust constantly shifting. But everything makes sense and the pace is perfect. The story just flows along. You are drawn in chapter after chapter until you can’t put it down and end up finishing it in a day like I did. Thank you NetGalley, Bookouture and Anna Mansell for the opportunity to read this book in exchange for an impartial review; all opinions are my own. I LOVE this author and adore her writing. And this book, wow! Beautiful and heartwarming, a wonderful celebration of friendship and resilience, love and loss, forgiveness and acceptance, moving forward despite setbacks - a stunning and poignant story about what it is to be human. LOVED this absolutely beautiful book - it reduced me to tears and uplifted me. Amazing. Very highly recommended to everyone. There is a saying that claims that women are the weaker gender. Well, I admit there are some things (not a lot obviously being a woman myself lol) that are more difficult for them but it goes without a doubt that there are certain things that men can’t do either. This story is a testimony to prove that this saying is total rubbish. This book is about 4 girls who used to be great friends, but lost contact over the years and now, out of the blue, they meet again and start reconnecting. It’s not an There is a saying that claims that women are the weaker gender. Well, I admit there are some things (not a lot obviously being a woman myself lol) that are more difficult for them but it goes without a doubt that there are certain things that men can’t do either. This story is a testimony to prove that this saying is total rubbish. This book is about 4 girls who used to be great friends, but lost contact over the years and now, out of the blue, they meet again and start reconnecting. It’s not an easy path they have to travel. They all have secrets and can they still trust each other? The author created a beautiful tale about friendship that can remain strong or even become stronger still, about finding out what it is what you want in life and going for it even if it’s not easy. Revealing secrets is not simple, especially if it means having to hurt someone’s feelings, but if you can save her from further heartbreak, it’s the right thing to do. Friendship, love, family, secrets and dreams are some of the ingredients this story is based on. It made me smile and certain disclosures … I did not see them coming. The short chapters spur you on. You want to keep on reading and honestly that’s the only thing you want to do once you have started. No need to add after all this that I loved it , but I am going to anyway : I loved it! 5 stars. Thank you, Anna Mansell, Bookouture and Netgalley. Relationships, Friendships, and Marriage are tricky territories but for four women who decided to get together for a small class reunion it may shed some light on the cracks and the desire to improve. They were once tight but have lost touch even though two ladies live nearby. So much has changed. So many lives altered. So many differences now exist. Emily was to be the success story but it's gone terribly wrong so much so that the secret she harbors is more epic than her failures in life. The reuni Relationships, Friendships, and Marriage are tricky territories but for four women who decided to get together for a small class reunion it may shed some light on the cracks and the desire to improve. The reunion was an idea by Lolly in hopes of bringing together Jess and Amanda with Emily for one quaint get together but this is anything but quaint. Thank you to Anna, the publisher, NetGalley, and Aldiko for this ARC in exchange for this honest review. Really enjoyed this one - the characters are all so full of life, so rich and real that I feel like I know them! Mansell drip feeds the reader with accuracy, constantly tempting them to read just one more page. And of course I absolutely loved the Cornish-isms, though it made me miss my adopted county even more than usual! The synopsis for Her Best Friend's Secret sounded so intriguing that I just had to read it. It sounded like it was full of deep, dark secrets that I was just dying to discover. Her Best Friend's Secret was about four different women who were the best of friends in their younger teenage years. After Emily moved away they slowly all drifted apart and went their separate ways. Years later when Emily moved back for personal reasons, a chance run in with Lolly had them arranging a reunion of the four friends. Lots of things had changed for Lolly, Amanda, Jess and Emily and they all carried secrets and baggage that they weren't sure they could share with each other. Would they understand? Would they be supportive or would they judge? As much as they all wanted to reunite, they were reluctant because of the things they were going through and the secrets they were hiding. At the heart of this book was friendship and the powerful bond that these four women had to overcome hardships with the support of each other. Each woman had her own issues but with the love and support of their circle of friends anything was possible. So what about the secrets they had? I have to admit that I was a little disappointed in them. They weren't as overwhelming as I was expecting them to be and they were all pretty easily resolved except for one of them. I was not at all pleased with the outcome for Jess with her secret. It was never revealed to the other woman and although she showed great personal growth, it wasn't ever really resolved. The secret that threatened to destroy Lolly and her friendship with Amanda turned out to be a reoccurring problem that Lolly was already aware of but that didn't involve Amanda. I honestly feel like the synopsis for this book should have focused more on the friendship angle than the secret angle. The secrets for the most part were not as exciting and shocking as it led me to believe and the friendship between the women were more enjoyable to read, in my opinion. I feel I might have enjoyed this book more had I not been expecting an earth shattering secret that would tear them all apart. I liked how it showcased that nobody is perfect and that we shouldn't be ashamed or hide who we are to the people we love because they are just as imperfect as we are. Love, friendship and strong women was what this book was really about. If you go into this book expecting a book about the bond between these women than you should really enjoy it. If you expect earth shattering or shocking secrets you might be disappointed. I really enjoyed this story of four school friends who reunite many years later after life has taken them in different directions. The problem arises when one of them knows something about the other's husband. Should she tell what she knows and risk their new-found friendship? The story deals sensitively with trust, control, betrayal and friendship as the friends each learn something more about themselves. An engaging story that will make you question your own relationships. I loved how the char I really enjoyed this story of four school friends who reunite many years later after life has taken them in different directions. The problem arises when one of them knows something about the other's husband. Should she tell what she knows and risk their new-found friendship? The story deals sensitively with trust, control, betrayal and friendship as the friends each learn something more about themselves. An engaging story that will make you question your own relationships. I loved how the characters just jump off the page and stay with the reader. I'm a huge fan of books that celebrate strong, independent women and this is definitely one of those. The story centres around 4 friends - Jess, Emily, Lolly and Amanda - who have drifted apart since their teenage years but who reunite in their early 40s facing up to the past and working out their current issues. There was a brilliant OMG moment mid way through the book which had me reeling, loads of moments with which I identified with and quite a few laugh out loud moments too. A warm, funny, enj I'm a huge fan of books that celebrate strong, independent women and this is definitely one of those. When four once inseparable school friends arrange to reunite after over twenty years of absence, they all nervously prepare themselves for their reunion. They had once been the very best of friends, but how would they react to each other after so long was the question that concerned them most. They needn’t have been concerned at all. Hashtag Friends Forever – that was what each of the women hoped would be their destiny. Emily is newly back home living in the childhood seaside village of Gorran Ha When four once inseparable school friends arrange to reunite after over twenty years of absence, they all nervously prepare themselves for their reunion. They had once been the very best of friends, but how would they react to each other after so long was the question that concerned them most. They needn’t have been concerned at all. Hashtag Friends Forever – that was what each of the women hoped would be their destiny. Emily is newly back home living in the childhood seaside village of Gorran Haven in Cornwall after living in the States for what seemed a lifetime of living the celebrity lifestyle. She has decided it is a false life for her and her agent/partner, and wants to live a completely new life surrounded by peace and tranquillity instead of hustle and bustle of a large, loud city. But she arrives alone and is stunned about the latest turn of events in once her busy life. All of the girls remembered the fourth member of the group Jess as friendly and outgoing but she had changed so much and had become quiet and lacking in self-confidence for no apparent reason. It’s as though she has had all of the life squeezed out of her and is afraid to live the normal life of a woman. She lives to work and is not at all interested in socialising. So, with the first meeting being a roaring success the women get to meet regularly and the reader is pulled into their lives, a wonderfully supportive group of four who help their friends through life’s ups and downs. This is an engaging and beautifully told story with four story threads and narrators that are each equally absorbing. The characters are well crafted and cleverly developed with interacting threads that lead to a warm and satisfying conclusion. The strong storylines involve relationships, betrayal, friendship, mutual support, love and loss, trust and forgiveness. I really enjoyed reading this novel and found the issues thought provoking and relatable. I received a complimentary copy of this novel from publisher Bookouture through my membership of NetGalley. These are my own honest and well considered opinions that are uninfluenced by any other reviews or publicity. This is a multi-layered and involving story filled with interesting and diverse characters and plenty of interest to keep you engrossed. Her Best Friends Secret was a delightful gentle read. Four childhood friends who reconnect after 20 years rediscover their friendship even though their lives have taken them in different directions. Emily has returned to Cornwall turning her back on her acting career in America. She has spent many years playing second fiddle to her partner but now has made the decision to change her life but will it include being a mother? And will her partner be part of her new life? Jess is a high flying adver Her Best Friends Secret was a delightful gentle read. Four childhood friends who reconnect after 20 years rediscover their friendship even though their lives have taken them in different directions. Jess is a high flying advertising executive who had put her heart and soul into her job. She left behind the love of her life when she went travelling years earlier but with his appointment at her firm she struggles with feelings she thought had disappeared. But will she act on her feelings especially as the one who got away is now married ? Lolly is married with two sons but is yearning for a daughter. Her husband doesn’t share her wish and her obsession with getting pregnant seems to be putting a strain their relationship. She feels something is not quite right. What could it be? Could it tear them apart? Finally Amanda is a single mother who raised her daughter herself but with her errant husbands reappearance she finds her daughter leaving to live with him Amanda is hiding a secret from everyone, one which has the potential to cause havoc. I personally know secrets and lies always come out and this book explores this fact perfectly. The way you deal with problems is paramount and I felt the characters grew together through the honesty and consequences of their behaviours. Love , friendships, secrets and strong woman are beautifully portrayed in this novel. Thank you to netgalley and the publishers for my chance to read this beautifully written book. I really enjoyed this story. The 4 main characters are each at a crossroads in life and reunite after 20 years. There is some strangeness and mystery as to how and why they suddenly fell out. The friendships that were rekindled were lovey. The women start out quite guarded and eventually they let down their defenses. There are surprises, some you may see coming and some not so much. This is a powerful story of women lifting each other up. That I did like. What I didn’t? The fact that almost every male character was deplorable. Ok, Mac was great, but that’s pretty much it. And the situation with Jess was handled somewhat strangely, really swept under the rug, after so much buildup. I’m satisfied with the conclusion and would recommend this book. It’s not a thriller so if you’re looking for that be warned but it was a great story of woman and friendships. I enjoyed this book very much with its four women characters and charming setting in the Cornish village of Gorran Haven. Emily, Jess. Lolly and Amanda were best friends in high school, but after Emily moved away at the age of 16 they drifted apart. After a couple of decades Emily decides to move back to the village she grew up in and the four friends have a reunion. Will they be able to rekindle their friendship and will that friendship survive secrets big and small? Anna Mansell does an excell I enjoyed this book very much with its four women characters and charming setting in the Cornish village of Gorran Haven. Emily, Jess. Lolly and Amanda were best friends in high school, but after Emily moved away at the age of 16 they drifted apart. After a couple of decades Emily decides to move back to the village she grew up in and the four friends have a reunion. Will they be able to rekindle their friendship and will that friendship survive secrets big and small? Anna Mansell does an excellent job with the story and bringing the characters alive. It kept me interested and engrossed in the book. Thank you to Bookouture and Netgalley for providing me with an advanced copy in exchange for an honest review. While I loved the stories of each of the four women in this novel, it was hard to accept that it took at least 20 years for each to find their true selves. Each woman held on to secrets, denying their true desires, and spent too many years being what others wanted them to be. Still, it is a beautiful story of friendship and acceptance. I'm so glad I requested to read this book! The story line really hits home, having friends that I very rarely see, however when we get together it's like we haven't spent any time apart. This story really captures friendship, in a way I really love reading about. It isn't just a happy story of girls getting back together after years apart, it has all the issues that being an adult comes with. Pregnancy, Marriage issues and Controlling partners. This book covers a wide range of issues that people a I'm so glad I requested to read this book! The story line really hits home, having friends that I very rarely see, however when we get together it's like we haven't spent any time apart. Pregnancy, Marriage issues and Controlling partners. This book covers a wide range of issues that people all around the world deal with on a daily basis. Really well written, and a pleasure to read. Wow, Her Best Friend's Secret has blown me away. Just fabulous. Review to follow on the blog tour where I'll be shouting from the rooftops how amazing it is. I fi Wow, Her Best Friend's Secret has blown me away. Just fabulous. Emily, Lolly, Amanda and Jess were the best of friends back in the day having shared some memorable and significant moments with each other. When Emily abruptly moved away it put an end to that. The group's dynamic seemed to change overnight and the remaining three began to grow apart as well. They're all in their forties now and at different points in their lives. Emily went on to enjoy acting success in America, Lolly became a physical therapist and is married with kids, Amanda who works two j Emily, Lolly, Amanda and Jess were the best of friends back in the day having shared some memorable and significant moments with each other. When Emily abruptly moved away it put an end to that. The group's dynamic seemed to change overnight and the remaining three began to grow apart as well. They're all in their forties now and at different points in their lives. Emily went on to enjoy acting success in America, Lolly became a physical therapist and is married with kids, Amanda who works two jobs is divorced and semi-estranged from her daughter, and Jess has forged a successful career in advertising and continues to enjoy her singleton life. Emily running in to Lolly on her return home is the catalyst that brings the four friends together again. Interestingly, all four are apprehensive about meeting up. After all these years, what could they possibly have in common anymore? However, they all come around when they recall the fondness they had for one another and that maybe they could do with some girl time. This was my favourite aspect of the novel - their reunion! As soon as they were in the same room it was like all that time and distance didn't matter. Getting reacquainted is a bit awkward at first but that bond they built as teenagers is as strong as ever. Behind the smiles they're all dealing with the demands of life and personal situations that feel too big to take on without the support of the girls. As troubling as their own problems are, one of them holds a big secret that could crush the other friend. Which brings me to the most standout part of the story: each of these women are strong in their own unique way. When they find the other in trouble, they come to each other's aid without hesitation or judgment. I loved that Mansell allowed Emily, Lolly, Amanda and Jess to embrace themselves as they are. I'd say out of all the characters I was most surprised by how much I liked Amanda. I think in my younger days I would've judged her the hardest, and this is the advantage of being older and wiser, I guess, because I'm learning to abide by the motto of to each her own. Don't get me wrong, I liked all of them but Amanda astonished me because she owns every decision she has ever made about her life and owes no one apologies for how she's finding happiness. I was rather fascinated by her. I'd previously read Mansell's How to Mend a Broken Heart and admired how she captured her characters' emotions in it. She's done the same thing with Her Best Friend's Secret. It takes a few chapters to set up the pieces but it's thoroughly delightful once it gets underway, even though I knew that Mansell would crush me shortly. And she did. It didn't lessen the blow even when I suspected what was about to come. I was so invested in this story, in these four women, in their friendship. I'm happy to say that Mansell does give each of them their well-deserved and fitting HEA. Female friendships are a tricky thing to write. It's hard to find heroines who feel well-rounded and don't succumb to one stereotype or another. Women are complex and when an author can capture that with sincerity and allow them their strengths and flaws, and celebrate their uniqueness, I'm all for it! It’s been over twenty years since four very different teenage girls sat on the beach, and swore to be best friends forever. Their lives went different ways after Emily left. But each remembered that promise. And none truly found friendship like it again. Emily is a 40 year old actress who is realizing that it may be time for a career switch. Even though she always thought she would be a Mum one day she didn't expec Your best friend deserves the truth. But it will ruin her life. What would you do? Emily is a 40 year old actress who is realizing that it may be time for a career switch. Even though she always thought she would be a Mum one day she didn't expect it to happen now and her partner is 100% not on board. With an appointment at a clinic she's trying to decide what's best for her. Jess is a highly successful advertising exec that is thrown for a loop when her ex-boyfriend is hired at her firm. She thought she was over him, but seeing him brings back feelings she thought were long gone. Lolly has everything she has ever wanted except a daughter, but her husband doesn't want a third child. She thinks she should be happy, but is heartbroken every month the pregnancy test reads negative. Events transpire that make her question if she's really happy or she's just made herself think this is what happiness is. Amanda was forced to scrimp and barely make ends meet when her husband left her with a young daughter years before. When he shows back up, her daughter decides to live with him and Amanda left trying to figure out what happened. She doesn't feel like she was the best Mum, but she definitely tried her best. Her daughter is embarrassed of her Mum's sexuality and has to decide if she can get past the embarrassment or cut her Mum off. I think just about everyone can relate to having best friends in school that we ultimately drift apart from. Just because you drift apart doesn't mean you can't reconnect and it usually happens when you need it the most. I think the author did a great job of creating relatable characters and a story that just keeps you wanting a little more. Each of the four women are faced with a life changing decision and finding out the outcome keeps you reading on. This book covers a variety of everyday struggles the reader will be able relate to (marital problems, unexpected pregnancy, and rifts between mother/daughter). I would recommend this book to anyone who is looking for strong female leads who aren't afraid to make midlife changes. I love that these women build each other up instead of tearing each other down. Are childhood friends forever? Can you trust them to be truthful, or should you be wary that after two decades of not seeing them, that they could blow your life to kingdom come? Her Best Friend's Secrets is about four secondary school friends, that come into each other's lives again after twenty years, after a chance meeting at a station between two of the friends, and a subsequent meetup changes everything. So rather than talk about the story as a whole, let's discuss the characters, starting Are childhood friends forever? Can you trust them to be truthful, or should you be wary that after two decades of not seeing them, that they could blow your life to kingdom come? Her Best Friend's Secrets is about four secondary school friends, that come into each other's lives again after twenty years, after a chance meeting at a station between two of the friends, and a subsequent meetup changes everything. So rather than talk about the story as a whole, let's discuss the characters, starting with the one that got them all back together. Lolly is a woman who wears many hats, Wife, Mother, physiotherapist! She is everything to so many, but she is missing the one thing that she really wants...another child. But is it all too good to be true? Emily is home after many years, with a secret she is not will to share at the moment. Years of being in the spotlight and being used by the man who is supposed to love her and keep her business interests at heart, she finally breaks free and comes home, to just be. Then there is smart, sassy and independent Amanda, who has had to raise her child by herself when her husband left, only to have him swan back into their lives, and bedazzle their daughter so she is now alone. But Amanda is hiding a secret from everyone, but is she willing to share it, if it saves someone else from deceit? And finally there is Jess, who is back from her world travels, seemly successful, carefree and happy, but Jess has devastating secrets she never wants to burden anyone with. What you find with this book is that secrets and lies have a way of coming out, but they can also make a person grow, take a second chance, be proud of what they become, and fall in love! And add that to the beautifully described backdrop of Cornwall, Her Best Friend's Secrets should be on your must-read list for the summer. I have read several of this author’s books before and have enjoyed every one of them, so was excited to get started on this new release. This book concentrates on four best friends – Emily, Jess, Lolly and Amanda. It has been 20 years since they promised to always be best friends but over those years they have drifted apart and their lives have gone down different paths. After a chance meeting, the friends are brought back together but they discover that their lives are not filled with secrets w I have read several of this author’s books before and have enjoyed every one of them, so was excited to get started on this new release. This book concentrates on four best friends – Emily, Jess, Lolly and Amanda. It has been 20 years since they promised to always be best friends but over those years they have drifted apart and their lives have gone down different paths. After a chance meeting, the friends are brought back together but they discover that their lives are not filled with secrets which they need to work through. I really enjoyed this book and loved the characters of the four friends. The characters are all so realistic and likeable that as the story moved on I found myself not just wanting to know more about each of them, but to also be part of the group myself! I loved it when they all came back together after all those years and yet it was like those years hadn’t happened – the sign of true friendships! The story is just as the title suggests – full of friendship, lies and of course, secrets! The book moved at a really good pace and after a couple of chapters I was hooked and kept mesmerised with the suspense of the story. I have to admit I did work out where the story was going, but this didn’t detract from the enjoyment at all. More and more often I find myself drawn to books published by Bookouture - not sure what that means, but because of it, I've joined a new Facebook book blogger group that notifies us book bloggers of new releases that are available on NetGalley and book tours that are available to join. 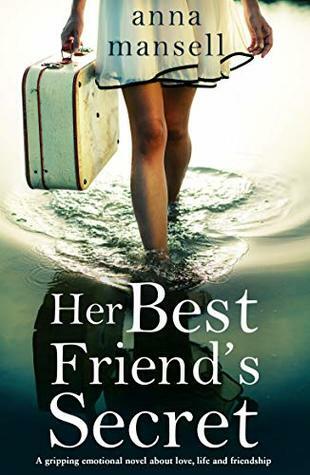 Today's book - Her Best Friend's Secret by Anna Mansell was listed as available to read and review, and because I had read (and loved) her book, I Wanted To Tell You. Twenty years ago, friends, Emily, Jess, Lolly More and more often I find myself drawn to books published by Bookouture - not sure what that means, but because of it, I've joined a new Facebook book blogger group that notifies us book bloggers of new releases that are available on NetGalley and book tours that are available to join. Today's book - Her Best Friend's Secret by Anna Mansell was listed as available to read and review, and because I had read (and loved) her book, I Wanted To Tell You. Twenty years ago, friends, Emily, Jess, Lolly and Amanda were sitting on the beach when they promised to be best friends forever. Then life happened - friends moved, began careers, circumstances changed, time moved on. Lolly and Emily have a chance meeting and they decide to get their group together again even though the women's lives have changed. They have each taken different life directions. When they get together again, they all realize that their bond is still there. Even though some of them have deeply buried secrets that are worrisome, it isn't until readers learn who someone is married to that they see their friends can be tested. Loved the book!! I couldn't wait to read this because I loved I Wanted to Tell You. The title was perfect because all four of the friends had a secret that they were keeping hidden. Jess's secret was a mystery until the end. but it was easy to figure out. I loved everything about the book- the characters, story and writing style. I enjoyed getting to know Jess, Emily, Amanda and Lolly. After twenty years, they were able to pick up right where they left off. Amanda and her occupation was quite a Loved the book!! I couldn't wait to read this because I loved I Wanted to Tell You. The title was perfect because all four of the friends had a secret that they were keeping hidden. Jess's secret was a mystery until the end. but it was easy to figure out. I loved everything about the book- the characters, story and writing style. I enjoyed getting to know Jess, Emily, Amanda and Lolly. After twenty years, they were able to pick up right where they left off. Amanda and her occupation was quite a story. It's pretty hard to tell people the truth about what you do for a living without the judgement. I never put two and two together until Amanda meets the girls for drinks and catches up about work, children and husbands. For some reason I really loved Pete. He seemed like such a good guy. He made some mistakes in his younger years with his daughter and Amanda, but is trying to make it better. He has a great relationship with Amanda. He never judged her and joked about what he could get for a ten pound note. I felt the saddest for Lolly, but in the end I think she was the strongest one out of the bunch. I hated that the book ended. I needed another chapter or two. I definitely recommend the book. It's about friendships, relationships, marriage, family and and following your own dreams. I can't wait to read more from the author. I loved the cover of the book. Her Best Friend's Secret by Anna Mansell is an emotionally engaging novel that will surely strike a chord with any woman who has cherished a female friendship at some stage in her life. This is a story about love, motherhood, and friendship and, ultimately, forgiveness. This is a lovely and reflective read that will have you rooting for these women, each of whom will feel like a personal friend by the time you read the final pages. Emily, Lolly, Amanda, and Jess were school friends living in Corn Her Best Friend's Secret by Anna Mansell is an emotionally engaging novel that will surely strike a chord with any woman who has cherished a female friendship at some stage in her life. This is a story about love, motherhood, and friendship and, ultimately, forgiveness. This is a lovely and reflective read that will have you rooting for these women, each of whom will feel like a personal friend by the time you read the final pages. Emily, Lolly, Amanda, and Jess were school friends living in Cornwall until life gradually took them in different directions and they lost touch. Emily has been living in the States, but upon returning to her home village has a chance meeting with Lolly, and the two women decide that a reunion of the foursome is in order. Each woman is facing challenges in her own right, and each of the group soon realize that they have missed the love and support that comes from a nurturing female friendship. But when secrets begin to emerge, the tentative second chance friendship that has started to take hold comes into jeopardy, as one member of the group knows something that could destroy another. Is the bond that the women share strong enough to withstand their relationship's ultimate test? This is a compelling and emotive read. The circumstances of each of the women in the novel really resonated with me, and I would not hesitate to recommend this book to my closest friends.